I woke up earlier than I used to. My first ritual: checking my iphone. Tremendeous amount of Whatsapp chat blew my mind. More than 1,2k chats. The most noisy conversation came from the news gathering’s Whatsapp group. There’s a bomb in Sarinah, Thamrin street. Some people injured, 2 confirmed dead, and the terrorists still shooting the police. Horrifying moment. There’re also issues that some places were attacked by the terrorist, including my office. I called my mom. She’s okay. And the issues were proven to be inccorect. The attack was just happened in Thamrin, other place in Jakarta is save, my Mom confirmed. A year passed by. 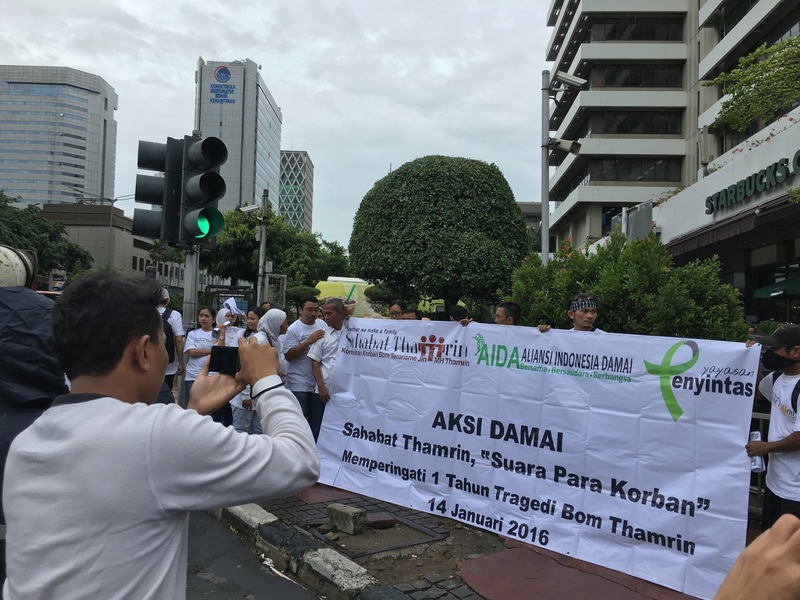 And here I am with the survivors and family of Thamrin victim. They mourned. At 10.05 am, they’re sowing some jasmine and red roses at the Police station on the intersections of Sarinah – Thamrin.